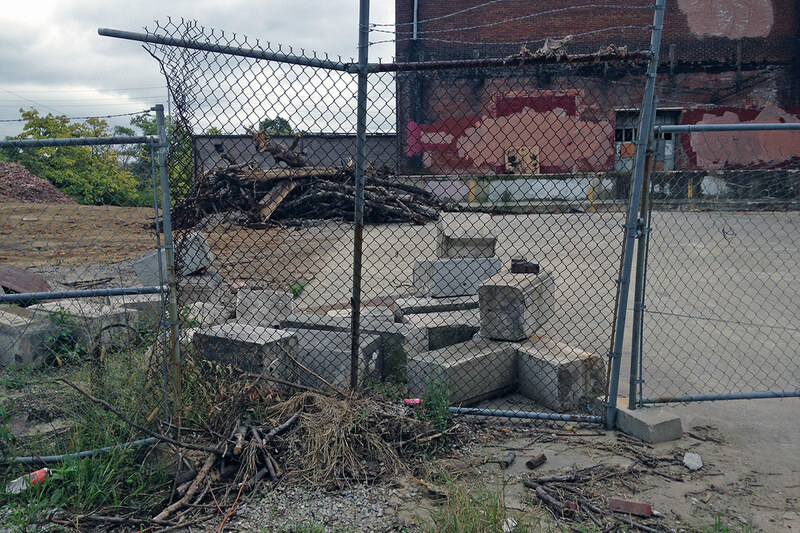 A small slice of Louisville beer history is now in the landfill. 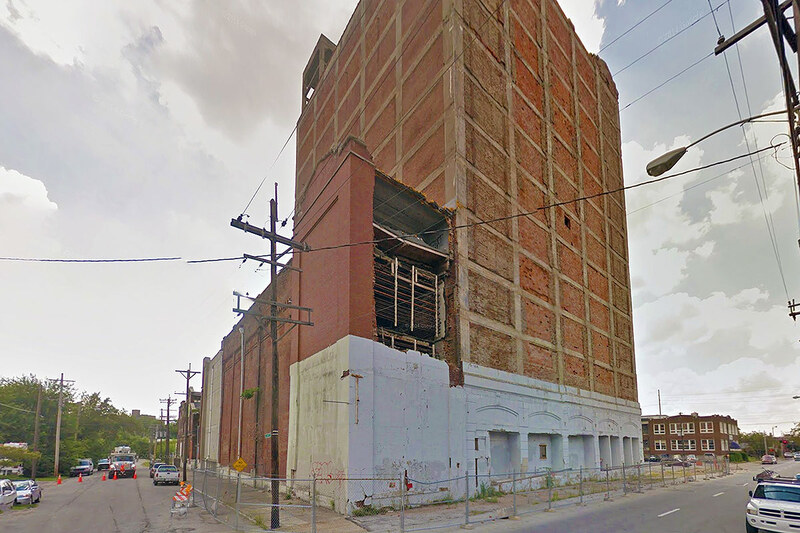 At the beginning of August, wrecking crews began razing a four-story brick structure at 801 Logan Street on the corner of Lampton Street in Smoketown. That structure is part of the much larger complex of cold storage warehouses on the site of a failed redevelopment scheme to create housing in the sturdy concrete tower. The complex of buildings is cause to cringe, with a sort of slow-motion succumbing to gravity playing out on the corner. Years ago, the tower lost its outer brick and stone facade after a couple loose bricks were spotted falling from the structure. The denuded building has been fenced off ever since. 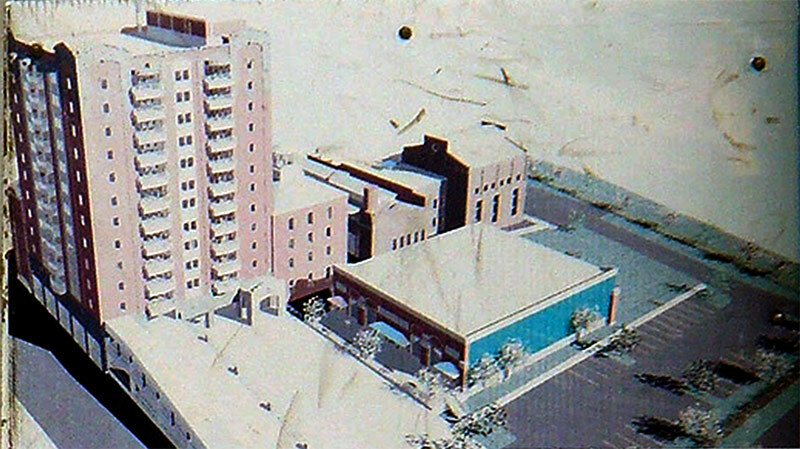 Rendering of The Louisville Lofts once posted on the property. A decade ago, business partners Gary Bates and George Breathitt planned to repurpose the buildings into The Louisville Lofts, essentially a larger version of the Ice House Lofts on East Main Street. A rendering circulated at the time showed windows cut into the building’s facade punctuated by balconies. Strips of brick were removed and a couple punched openings inserted, but nothing ever came of the project. In the Spring of 2010, we reported that bricks were observed falling from the tower’s windowless facade. The sidewalk had already been blocked off years prior and no one was injured, but the remaining facade brick and stone details were removed, leaving the raw structure we see today. Bates told Broken Sidewalk in 2010 that the project was still a go and that a new plan was in the works, but it now appears the development is dead. More bad news struck the site a year later in 2011 when a portion of the corner facade collapsed revealing a gaping hole in the Logan Street side of the building. That hole remained for four more years. Scope to include the removal of a portion of a 3 level structure with a footprint of 2700 sqft that is failing (structurally). Contractor Shall comply with 2013 KBC and specifically LG & E safety regulations dealing with overhead power lines. All structure including foundation to be removed and graded and seeded and strawed. Permit expires 30 days from issuance. It wasn’t until August that the building was reduced to rubble. Repeated calls to Bates’ office were not returned, but one person there told us there were no development plans in the works. The site still has not been fully secured months after demolition as concrete block is being put in place to block entry to the structure. Rendering of the original brewery circa 1906. The corner’s enormous tower, now more eyesore than icon since its Beaux Arts brick facade was removed, dominates the site today. It’s one of several large-scale historic industrial sites in the neighborhood. But at the turn of the 20th century, the site had a much different appearance as the Schaefer-Meyer Brewing Company, one of the city’s most prominent breweries in the late 19th and early 20th century. In 1901, the facility (sans the tower) churned out some 50,000 barrels of beer annually. Schaefer-Meyer was later sold to the Fehr Brewing Company, but the brewing operation did not survive Prohibition. Instead, Fehr repurposed the facility as a cold storage warehouse in 1920. The original facade was emblazoned with a large stone “F” in each corner. A few of the original buildings remained, hidden in plain sight. The corner that was demolished was one of those. There are still traces of the original on Lampton Street, including two brick buildings just east of the demolition site. If you look closely at the plastered-over plate above the door, you can still make out the initials S.M. & Co. marking the original brewery. Around back, pieces of the tower’s facade are visible piled behind a fence. Hopefully one day as Smoketown’s fortunes continue to improve, the facility can return as a viable development site. For now, it’s on ice.